Help our furry friends by donating food to your local animal shelter or clinic. Our statewide goal is to donate 10,000 pounds of food! Visit our Facebook page to log your donations and share your experiences. 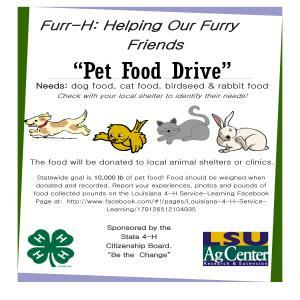 Photo By: Hester, Katina M.
The State 4-H Citizenship Board is promoting a statewide pet food drive with donations to local animal shelters in each parish. This site will be dedicated to helping parishes support the service focus throughout the year. Each month you’ll find ideas, resources and strategies for supporting animals. Try a contest to see which school or club in the parish can raise the most pet food in the parish. Maybe offer a prize to the winning club, like an ice cream or pizza party. Talk to local business owners; see if they are willing to contribute funds, or products from their stores. Some retailers will give away dented cans or torn sacks of animal food that are unsellable but fine to eat. Play games or do an activity that shows 4-H'ers the importance of donating to an animal shelter and other ways they can help animals in their area. National Pet Day is April 11! Plan a special event in your parish to get donations!